On the surface, Caryl Churchill’s A Number may seem less politically oriented than some of her more recent efforts. It shares the short running time and cropped dialogue of such pieces as Drunk Enough to Say I Love You? but deals with subject matter much closer to science fiction than current political global conflicts. 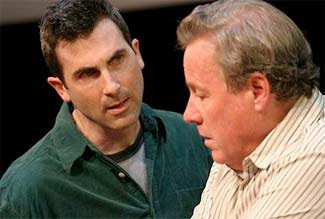 A Number, which is now running in a very good production at L.A.’s Odyssey Theater on the west side, is a two-hander between an older man in a series of conversations with a younger man who plays both his son and at least two clones of his son. It’s a not too distant future where cloning is a reality and fathers and their genetic sons must deal with a myriad of issues inherent in such a world. It's not science fiction, though it has the kind of futurist edge that inspires a sound designer to use 20th-century minimalist music to background the scene transitions. The truth of the matter, however, is that despite its scientific and psychological overtones, A Number is as much a political venture as anything else Churchill has produced in recent years. While there is a pretense of psychological underpinnings and has elements of both thrillers and melodrama, the play is really about much larger issues. And while the piece raises virtually every moral question you could imagine about the implications of cloning human beings, Churchill seems intent on dismissing them all as outlandish. There are wild turns in the plot with an “original” son threatening and eventually acting out violence against his later replicants. The father explains, and then later amends, a history of how all the clones came to be in the first place. All of this is amidst the father's concerns that he get his due by suing the "mad scientist" who created multiple unauthorized additional clones without consent. The humanity of clones is debated at length between father and son. But this is all much ado about nothing. In her brilliant final scene, Chruchill thrusts the irrelevance of these debates into the light of day, pointing out how the sensational moral debates eclipse all logic and reason in considering such a future. A clone arrives to see his genetic father, only to disappoint him with a total lack of emotional turmoil over any of the earlier issues laid out in the play. He has no stance or information to share about his relatedness, or lack of it, to his genetic precursors. His life is good. Don't worry, be happy. It's a turn of events with a point of view that needs to be heard. The two parts here are played by a very good John Heard as the father and Steve Cell as the many possible sons. Chruchill’s dialogue, with its endless fragments and interruptions, can be difficult to choreograph in an authentic way, but these two actors were masterful in getting around the inherent problems in this tactic. A Number is an admirable work with a distinct and interesting point of view. And while it may be more intellectually satisfying than psychologically insightful or emotional, it's quite a good play. The production runs through June 21 just north of Sepulveda and Olympic.